Why do we meditate on Emptiness? Form is Emptiness; Emptiness is Form. Feelings are Emptiness; Emptiness is Feeling. 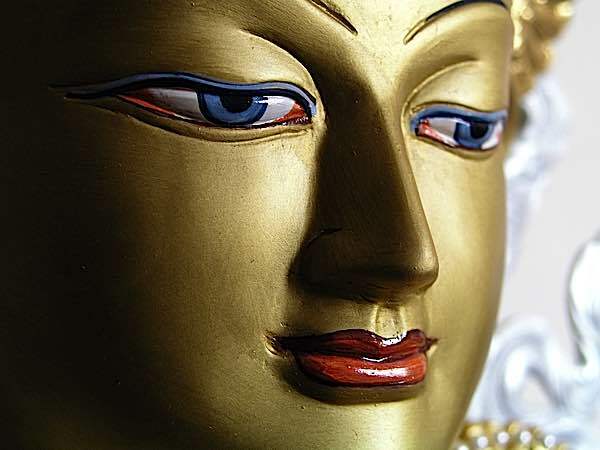 He explains the profound meaning — and why it is comforting to Buddhists. Rinpoche starts by explaining dependent-arising and how we do not exist independently. His discussion on Emptiness of Feeling is especially helpful for people who are going through difficult times. 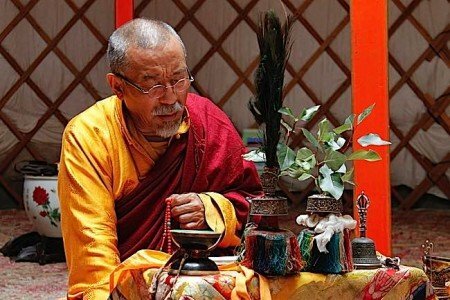 Watch for Part 2 of this series, where Rinpoche discusses the remaining three Skandas and helps us understanding the profound concepts of Shunyata. H.E. 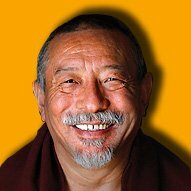 Zasep Tulku Rinpoche brings clarity for all levels of student on this difficult concept and delivers a wonderful commentary on this important sutra. The Heart Sutra or Essence Sutra presents the meaning of Shunyata in a very concise and penetrating way. It is the briefest of all the Perfection of Wisdom Sutras. The full-length Sutra of the Perfection of Wisdom has 100,000 verses. Then there is the middle length Perfection of Wisdom Sutra, which has 20,000 verses, and then a shorter version of 8,000 verses. Full Biography of H.E. Zasep Rinpoche below Heart Sutra. H.E. 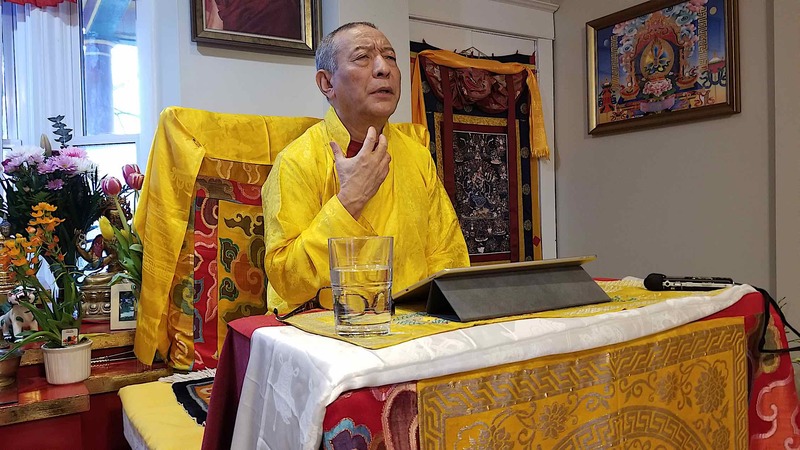 Zasep Rinpoche delivering an inciteful commentary on The Heart Sutra at Gaden Choling in Toronto. The subject of the teaching today is a commentary on Heart Sutra. Heart Sutra is the essence of Prajnaparamita sutra. The reason why it is called heart, because it is the essence; also it’s like a physical heart of human body, it’s one of the most important organs of the human body. Like that, this is one of the most important teachings. 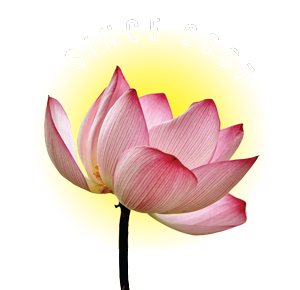 It starts with, “Thus have I heard.” So after Buddha entered Nirvana, his disciples, great disciples, Mahākāsyapa, Shariputra, Subhuti, Ananda, and so forth gathered together with the thousands other monks and practitioners and had a great council, and then they decided to record the teachings. So one of the great disciples, Shariputra said, “Thus I have heard”. So they recorded the teachings in their mind, in their deep, profound samadhi and unforgetting samadhi. So then they start talking, and then wrote down on palm leaves, this is how it started. The Heart Sutra was taught at Vulture’s Peak Mountain in Rajagriha in central India, Magadha Kingdom. And there is a mountain, and these rocks have shape like vultures, like they’re gathering. That’s why we call the Vulture’s Peak Mountain. So many Bodhisattvas gathered and many arhats gathered, and at that time Buddha himself entered into deep, profound samadhi. And it’s called profound illuminations… entering profound samadhi. The Heart Sutra is actually not a spoken word of the Buddha (it is the spoken word of Avalokiteshvara), and this sutra is endorsed by the Buddha and approved by the Buddha and blessed by the Buddha himself. 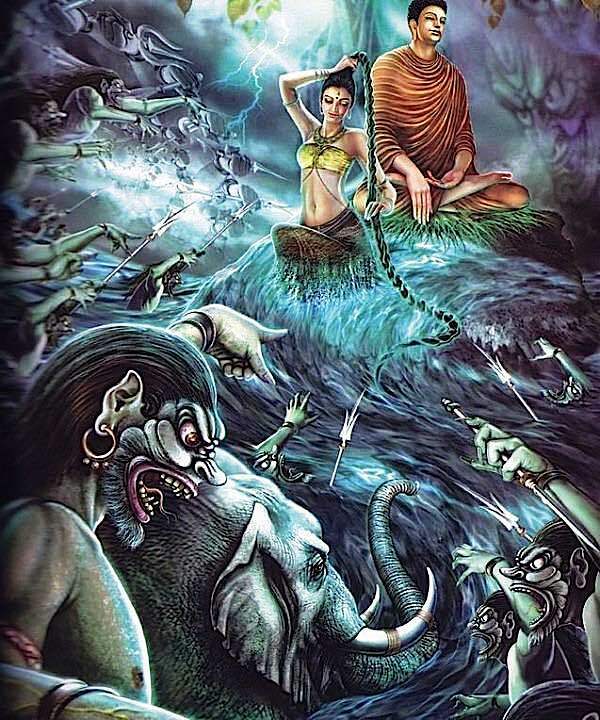 And what happened here is that Buddha himself entered into this deep samadhi, then Bodhisattva, Avalokiteśvara, and Shariputra, who were sitting close to Buddha, perhaps on each side of the Buddha, and then there was so many listeners and Bodhisattvas and arhats, monks, and so forth. 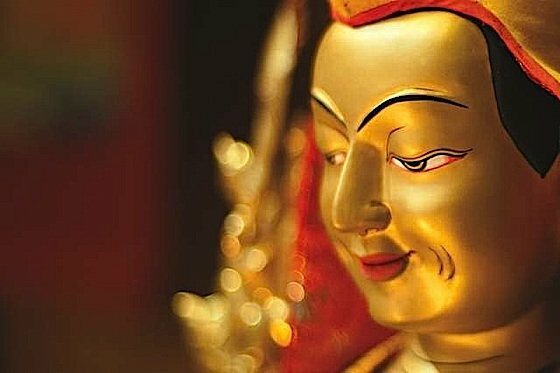 The very face of compassion, Metta personified in glorious Avalokiteshvara, the compassionate Buddha, who explains Emptiness in the Heart Sutra on Vulture’s Peak. 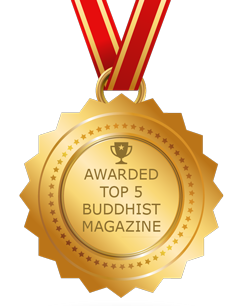 Shakyamuni Buddha listened and endorsed the teaching. Cover of a precious copy of the Heart Sutra. So all five skandas are emptiness, or empty of inherent existence. So what it means is that each of five skandas — they do not exist inherently, and they are independent. So when we hear, when we talk about form is emptiness, we’re not talking about the form doesn’t exist, there is no form, and we’re not negating the form or refuting the form. How could you do that? Not possible and not necessary. And form is emptiness means the true meaning, deep meaning, at an ultimate level, the form doesn’t exist all by itself, and independently. So if you look at, or when you look at, when you meditate, if you look at the body from meditate … If you do analytical meditation and look at from the top of your head to the bottom of your feet, go slowly, do what we call “sweeping meditation,” it’s like you’re sweeping the floor with a broom from one end of the room to the other end of the room, and that’s sweeping, right, sweeping the floor. Like that, we can do sweeping meditation of the body. Our modern term, today’s term of technology, you could say, “scanning the body.” So you can do that, and you look through the body, outside the body, and outside this body, or inside the body, doesn’t exist independently, inherently. This body is high maintenance, as we all know. You have to eat good, you have to drink water, you need to sleep, you have to do exercise, and you need go for a walk, drink lots of water, and so on and so forth. And then you try to do some practice meditation, a mindfulness calm abiding meditation, you do mantras and so forth to release your stress and tension, mental health and happiness and so forth. This body is high maintenance, so this body need a lot of things, and this body is dependent on so many things. And ever since the body is started, when the body was very small, and inside mother’s womb, and as you grow, as a baby, and then you have more maintenance. And as you get bigger and bigger, more food and more consumptions, require so many things. So this body is interdependent, and what we call, “dependent-arising.” But at the same time, this body is empty of inherent existence. So the emptiness and dependent-arising, they are co-existent, like one side of the door is the entrance, the other side of the door is the exit. So it’s one door, without entrance there is no exit; without exit, there is no entrance. Likewise, dependent-arising and emptiness are one. For example, when we say dependent-arising, it naturally means there is no independent, right? Nothing is independent exist. So that’s the same as when you say emptiness, emptiness of inherent existing, or independently existing. So this body doesn’t exist independently, it cannot live, support, and sustain independent. 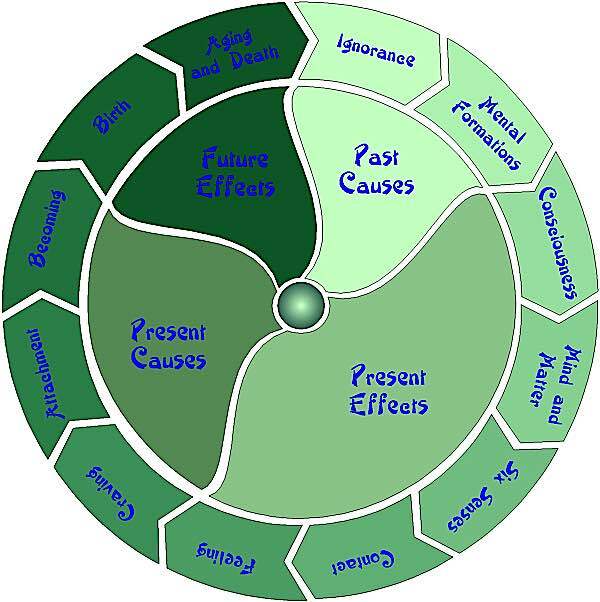 Dependent Co-Arising depicted as a cycle. Although we speak of “beginning at ignorance” it’s actually a never-ending Samsaric cycle. So therefore, we are saying here form is emptiness, the Avalokiteshvara said, “Form is emptiness.” And when you look at the form, you don’t find the independent existence, any part of form, or any kind of form, therefore the form is emptiness. The emptiness of the form is a form because the emptiness of the form is based on form. Without the form, there is no emptiness of form. So emptiness of form is based on form, for that reason we say the form is emptiness; emptiness is also form. The emptiness of form is form. Lovely statue of the great sage Lama Je Tsong Khapa. As long as you are separating, totally separating dependent-arising and the emptiness, then you don’t understand emptiness, because they are one. And this is the middle way, what we call Madhyamaka, so form is emptiness. Now, so why do we meditate on the emptiness of form, and why do we have to try to understand emptiness of form? Because this body, as I said, it has lots of many parts, and I mentioned that, right? So also, we have attachment to this body, and we have aversion to this body, we have some form of aggression towards this body, or somebody else’s body, and lots of mental defilements: ignorance, attachment, and anger, and so on and so on, lots of mental defilements arising. And due to this body, and for example, craving for food and drink and this and that, alcohol, cigarette, drugs, all these cravings, because your body says, “I want this, I want this, I need this.” Not just body, but mind too. It is all associated, all five skandas go together. So this is why we meditate on emptiness of form, [inaudible 00:16:37], so when you meditate on form, emptiness of form, then you begin to see the nature of this body is emptiness, right, and Shunyata, and doesn’t have inherently good or bad, and this and that. And the meditation on emptiness of the form is remedy, and is antidote for defilements and attachment and craving, desire, and so forth that has to do with this body and arising from this body, coming and going and so forth. “Oh, I’m not beautiful anymore, I’m getting old, my body is changing, I look awful.” And this is fear, right? This is fear and also sorrow and sadness, and all this is happening because of the body and this form, and craving on this form. This is why we will meditate on emptiness of form. It is very beneficial, we can overcome attachment, craving, and fear, and anxiety and so on and so forth. This is why we meditate on emptiness of form first. And then the next second skanda is the feeling, the Buddha said, “Feeling is emptiness; emptiness is also feeling.” So now, similarly we are, as human beings, living beings, here we have a feeling. We have usually three types of feelings: happy feeling, unhappy feeling, and neutral feelings. 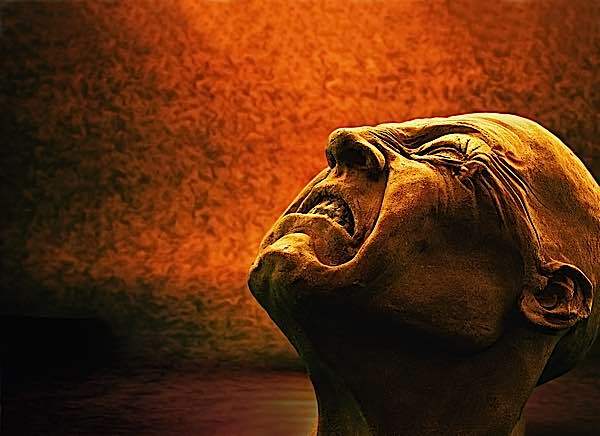 The root of suffering is attachment and clinging. And then the next second skanda is the feeling, the Avalokiteshvara said, “Feeling is emptiness; emptiness is also feeling.” So now, similarly we are, as human beings, living beings, here we have a feeling. We have usually three types of feelings: happy feeling, unhappy feeling, and neutral feelings. So the feelings go up and down and change. One day you’re happy, next you’re unhappy, and then this week you’re happy, next week you’re unhappy, or sometimes feeling changes within the day or within hours. And then sometimes you neither feel happy nor feel sad, and you feel a kind of neutral feelings, or perhaps dull feelings, and gray kind of feeling, and also slowly, slowly kind of a depressing feeling. And that’s why people get depressions, and then very, very difficult. And once you’re going into depression, it can be very difficult. And then you have to take drugs and so forth, then side effects and so forth. So there’s different kind of feelings, and the feelings are also cause of defilements, and some feelings are cause of grasping and excitement, whatever, and unbalanced, goes up too fast or goes down too fast, whatever, no equilibrium, no equanimity. So that’s why we meditate on feeling first, see what is feeling, and then how does the feeling exist? And does the feeling exist independently, permanently, or not? And you meditate and look at the unhappy feeling, and then meditate on anicca, the impermanence of feeling, and feeling changes. So when you meditate on impermanence of feeling, then you feel, “Well, it’s not a big deal, my feelings change. Right now I feel a bit sad, alone, but I’ll be okay. Tonight or tomorrow, I will be fine, especially if I meditate and practice mindfulness and breathing, or if I meditate on deity yoga and do practice, and so forth, I will feel better.